Τennis There are 22 products. FULL ZIP HOODIEZip on this comfortable jacket and get going. The full zip construction lets you pull this jacket on or off in a flash and layers effortlessly. Plus pockets help secure your smaller items when you're on the move. LUXURIOUS TOUCH. FREEDOM TO MOVE. The NikeCourt Team Pure Women's Tennis Tank Top is made with super-soft, sweat-wicking fabric and a racerback for lasting comfort and wide range of motion during play. The double-layered front enhances support, and the shaped hem creates a flattering fit. A SLIM-FIT TENNIS SKIRT WITH UV PROTECTION. 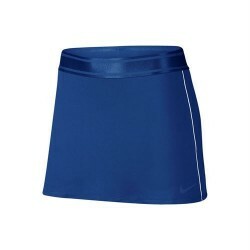 Dominate the court in this women's tennis skirt. Made from sweat-wicking Climalite fabric that sweeps moisture from your skin, it also provides UPF 50+ protection against harmful UV rays. Built-in briefs provide extra comfort, while side pockets let you store balls when you're not hitting them.